Johannne Berend Petermann (AKA Johann, John and Bernard) was born in Ganderkesee, in the Duchy of Oldenberg, Germany in 1843, the son of Johann Christopher Petermann and Gesche Margarete Engelbart(h). Berend Petermann spent 14 years at sea with German commercial shipping lines. J. Berend Petermann and Sophie Steuer has a son, Johann Bernard, born September 18, 1879, two months before thier marriage. Berend Petermann married Sophie Steuer in Elsfleth, Germany in November 1879. They immigrated to the US sometime between their marriage in 1879 and the birth of their son, Christian August, who was born in Brooklyn, New York in 1883. They had five children: Johann Bernard (1879), Christian August (1883), Wilhelm (1884) who died as a infant, Meta (1886 and Anna (1887). The family settled in Hoboken, New Jersey. Berend Petermann died in Hoboken in 1909. All the records in Germany list him as Johann Berend or Berend Petermann. However, he was listed in various records in New Jersey as John or Bernard Petermann. Notes: Berend and Bernard appear to be the same names and are variations of an Old High German name, Berinhard [from bern bear and hard brave, strong]. Maybe Bernard was considered more "America" than Berend. * Johann Berend Englebart was Gesche's brother. ** There were several Harmen Wilke Englebarts in the parish all related to Gesche. Ganderkesee is a municipality located between Bremen and Oldenberg in Lower Saxony. Today Ganderkesee contains 25 hamlets. J Berend Peterman was listed as living in the hamlet of Hoyerswege on the Bremen Crew lists from 1867 to 1872. Ganderkesee church is St. Cyprian and Cornelius, Ring 14, 27777 Ganderkesee, Phone: 04222 / 942 00. Go to Die Gaukirche St. Cyprian und Cornelius in Ganderkesee to see some lovely images of St Cyprian and Cornelius. *My understanding is that before container shipping a stevedore and a longshoreman (or dock worker) were separate jobs. The stevedore worked exclusively on the ship loading cargo into the hold. The stevedore was a crew leader and had a knowledge of the way the cargo need to be laded so the ship would ride correctly and the cargo would not slip around in rough weather. Too much heavily stowed cargo too low down could cause the ship to ride stiffly. It the center of weight was too high the ship might list to one side or the other. Stowing cargo was somewhat of an art form. Longshoreman worked on the docks getting cargo to and from the ship. Johann Berend Petermann went to sea at the age of 16. He signed up for 13 tours of duty which took him "around the world" several times. He spent 14 years at sea; his last voyage was in 1873. From my armchair point of view it seems like great adventure. Ganderkesee is about 12 miles from the famous port city of Bremen. Many young men from the town of Ganderkesee went to sea. Berend's first voyage was to Greenland on a whaler in the winter of 1859. Later that same year he sailed for the Far East — destination Hong Kong. In April 1861 the ship he was on was turned back from Charleston, North Carolina a few days after the Confederates fired on Fort Sumter starting the American Civil War. He headed for South America in the fall of 1861 and continued on to China. In 1864 he deserted ship in New York City. I believe that he spent two plus years in the Orient before leaving his ship in New York in 1864. In the spring of 1867 Berend Petermann was back in Germany where he signed up for a trip to Bahia, Brazil. He made two tours to Baltimore in 1868 and a tour to New York in 1869. In 1870 headed "to sea" on the bark TEXAS the ship was recorded as sailing to Germany from Philadelphia. On July 19th she was forced to take refuge from the French warships in Stornoway, Scotland. In 1871 and 1872 Berend sailed twice to the West Indies. I do not know if he completed the trip in August of 1871. The ship was headed to Aspinwell in the Isthmus of Panama, but was towed to Southampton on August 17th. In the fall of 1872 and the spring of 1873 he traveled back and forth from Bremen to New York. He started as a common seaman but by 1872 he was a helmsman. The helmsman is the person who steers the ship. He was not listed on the Bremen Crew Lists after 1873. Johann Berend Petermann made 12 tours at sea. I am not sure that he always arrived at the destination the Sailors Registry indicates. Berend Petermann born 1843, Ganderkesee, muster date 22 October 1859, Captain Lamke, ship JOHANN LANGE, destination, England and Hong Cong, junge duration of service 15 months 4 days. Berend Petermann, born 1843 resident Hoyerswege, muster date 17 August 1867, ship, Dorothea, port of departure, Bremen, destination, Bahia, Brasilien Matrose [sailor]. Captain Fangmeyer, duration of service 5 months and 9 days. Berend Petermann finished his tour at sea on May 12 1873. By 1879 he was a helmsman living in Elsfleth, a port on the Weser River. The Weser is one of the major rivers in Germany. It flows north through the major port cities of Bremerhaven and Bremen. However, the river is rather shallow and during periods of drought was not navigable near Bremen. Elsfleth lies about midway between the two cities. "Sea-going ships may ascend to Elsfleth, though Bremerhaven is the chief port for large vessels." Berend would return to the States about 10 years later with his wife and small son. What is the difference between a ship, a bark, a brig and a schooner? In the sailors register from 1859 to 1861 the residence of Berend Petermann was Ganderkesee with the exception that in October 1859 he listed Mittelsburen. Mittelsburen was a village outside Bremen. From 1867 to 1873 his residence was listed as the hamlet of Hoyenswege with the exception of October 1872 when he listed Ganderkesee. Hoyerswege is a hamlet in the town of Ganderkesee. Move to Elsfleth While he was giving addresses in Ganderkesee and Hoyerswege from 1859 to 1873 Berend Petermann was obviously spending a lot of time at sea and traveling around the world. The last Bremen seaman's record for Berand Petermann was in 1873. J. Berand Petermann had a son born in Elsfleth in 1879. Elsfleth was/is a seaport at the confluence of Hunte and Weser rivers. At the birth of his son, Johann Berend Peterman was listed as a helmsman. Johann Bernard, a Child of Johann Berend Petermann and Sophie Steuer, born 1879. Johann Berend Petermann and Anna Sophia Steuer had a son Johann Bernard born 2 months before their wedding. See Children of Johann Berend Petermann and Anna Sophia Steuer below. Note: There is something else written at the bottom of this record that I cannot read. It refers to Ganderkesee. There is no similar notations on the other marriage records on the same page. Note: The records indicate that Johann was fourteen years older than Sophie and that Sophie and Johann had a son, Johannes Bernard, two months before the marriage, see baptism of Johann below. Marriage: Rose Maher, May 20, 1908, see John Petermann below. Christopher circa 1914, see John Petermann below. Census Records: John Petermann was listed with his parents until the 1910 census when he was listed with his wife and son. He was listed in the 1920 census. See John Petermann, below. Other information: For more information on John Petermann either go to John Petermann now or at the bottom of the page. Birth : Christian August Petermann born April 6, 1883, 189 Conover Street, Ward 12, Brooklyn, New York, family residence, 282 Conover Street, mother, Sophie Steuer, age 25, born Oldenberg, Germany, father, Johann Bernhard Petermann, butcher, age 30, born Oldenberg, Germany. Note: Conover Street is located in Red Hook, Brooklyn. Census Records: Christian Petermann was listed with his parents until the 1910 census when he was by himself. I did not find him in the 1920 or 1930 censuses. See Christian Petermann, below. Other information: For more information on Christian Petermann either go to Christian Petermann now or at the bottom of the page. Birth: July 1884, Hoboken, New Jersey. I could not find his birth certificate in the civil records. His birth information was taken from his death certificate. Diphtheria is an acute infectious desease, usually of children. It causes severe inflammation of the throat, heart and nervous system. It is now preventable by inoculation. Flower Hill Cemetery is located at 5433 Kennedy Blvd North Bergen, NJ. On my visit in August 2006 I was told that Wilhelm Petermann was buried in a single grave, not in a family plot. since the family plot did not have a head stone I did not look for Wilhelm's grave. Birth: Hoboken, New Jersey, January 18, 1886. Note: I did not find a birth record for Meta Petermann in New Jersey. Unrecorded births before 1900 were quite common. Marriage: Percy Land, January 18, 1908, Hauppague, Long Island, New York. Meta Helen Land born February 14, 1910, Hauppague, Long Island. Death: Meta Petermann Land died on January 5, 1973, age 87, in Smithtown, New York. Other information: For more information on Meta Petermann after her marriage to Percy Land either go to Meta Petermann now or at the bottom of the page. Birth: Sophie Petermann was born on October 24, 1887 at 65 Willow Street, Hoboken to Bernherd Petermann, age 40, longshoreman, born in Germany, and Sophie Mary Stauer, age 30, born in Germany, she was listed as the 5th of 4 living children by this marriage. Other Information: For more information on Annie Petermann either go to Annie Petermann now or at the bottom of the page. The records from Elsfleth indicate that Johann and Sophie did not have other children baptized in the local church. It was a common practice in some German families to name one's sons and daughters according to a pattern. The first son was frequently named for the father's father, the second for the mother's father, subsequent sons for the father, the father's paternal grandfather, and then the father's maternal grandfather. The first daughter was frequently named for either the father or the mother's mother, second daughters were the reverse, third daughter's for the mother or mother's oldest sister. The exact date of immigration is not known. They were in Brooklyn at the time of Christian's birth in April 1883. They were still in Germany at the baptism of Johannes Bernard Petermann in September 1879. According to the 1900 federal census Bernhard and Sophia immigrated in 1882, which was a peak year for immigration from Germany. According to Bernhard's death certificate, they immigrated in 1884. This cannot be correct because Christian was born in Brooklyn in 1883. In the 1920 federal census John Bernard Peterman was listed as having immigrated in 1883. This can only be true if they immigrated before Christian's birth on April 6, 1883. The Petermanns were not listed in the 1880 census in New York or New Jersey. There is no listing for them in Germans to America, a reference index that lists many Germans who immigrated to the United States between 1875 and the late 1800s. Oldenburgische Gesellschaft fur Familienkunde e. V. (Oldenburg Society for Family History) lists Johann Berend Petermann in their "Auswanderer" pages. Some of the information comes from my web site but the enlightening part is the date and place of birth of J. Berend's father. This was their address at the birth of Christian in July 1884. In 1881 Henry M. E. Thorman was listed as a "provisions dealer" at 206/208 Conover. By 1884 Henry Thorman ran a pork processing and packing plant at this address. His establishment was destroyed by fire in July 1884. The stock, consisted of pork in barrels, in the course of preparation for curing, was almost completely destroyed. It was covered by insurance. In November 1884, Henry M. E. Thorman a pork butcher on Conover street, was sued in July 1884 to recover a promissory note for $30,000. He had used his Conover street house and lot as collateral. It is possible that Berend Petermann worked in the pork processing plant owned and operated by Henry Thorman. After the plant burned the Petermanns may have moved to Hoboken to find other employment. Sometime between the birth of Christian in April 1883 and the birth of William in July 1884 the Petermanns moved to Hoboken. Hoboken lies just across the the New York harbor from Brooklyn. In the 1880s there was a ferry that ran between the two cities. There were no Petermanns or Steuers listed in the 1892 New York, Kings County Census, Ward 12., Red Hook, Brooklyn. This is the Ward where Christian was born in 1883. The 1885 New Jersey census was taken for statistical purposes. Consequently, it does not contain much helpful genealogical information. However, it does establish that the Petermanns were living in Hoboken in 1885. The New Jersey census of 1885 lists the family of Bernhard Peterman in the first Ward in Hoboken as follows: "Bernhard", Sophia, John, Christian, and William Peterman. The directory was basically a telephone book before telephones. A small fee was charged to be listed. Not everyone was listed every year. Bernhard Petermann was listed in the 1885-86 Directory at 101 Park Avenue, Hoboken. 1895: laborer, 36 2nd ave.
Bernard and Christian were listed at 32 2nd Ave, Hoboken in the 1910-11 Directory. Richards, clk, 83 Bloomfield, Hoboken, 1899-1900. Note: Bernard was not listed in this directory. On October 31, 1891, John Petermann made a Statement of Intention to become a US citizen in the Hudson County Common Pleas Court in Jersey City. There is no information other than his name, John Petermann, born in Germany and the name of a witness who had known him for five years, William Wise. He apparently never completed the naturalization procedure in this court. The applicant filed a Statement of Intention any time after his arrival in the United States. After a period of five years he could file a Petition for Naturalization. Several days to weeks later he would be granted or denied citizenship. In the case of John Petermann the first papers were filed, but there was no follow up. There is no Petition for Naturalization and no Certificate of Naturalization. Before 1922 only men over 21 could file for naturalization. Their wives and any foreign born children became citizens under their husband/father's naturalization. John Berend Petermann obviously though he was a naturalized citizen. He lists himself as naturalized in the 1900 United States census and in the 1905 New Jersey census. Surprisingly high numbers of immigrants did not become citizens. Studies from the 1890-1930 censuses show that only 25.7% of the population said they were naturalized. It would appear that less than that actually were naturalized, if there are others like John Berend who said they were naturalized when they weren't. There was also someone named, Geogiana Schultz, foreign born, between the age 20 and 60 living with them. Information taken from the 1895 New Jersey census Ward 1, page 55. There is no address given in this census. On September 28, 1899, Sophia Annie Stuer Petermann, age, 42, occupation, housewife, birthplace, Germany, last place of residence, Hoboken, New Jersey, how long in this state, 14 years, place of death, 36 2nd Street, Hoboken, father's name, William, mother's name, Bertha, died on the 28th day of September 1899, cause of death, uramic poisoning resulting from nephritis, place of burial Flower Hill Cemetery. Nephritis is an inflamation of the kidney. Note: According to the information originally supplied by the Flower Hill Cemetery, in response to my request for the interment list of the burial of John Petermann, only Sophie and John are buried in the plot. However, on a return visit in August 2006 they told me that John Petermann, junior was also buried in the same plot. Apparently the confusion resulted from the difference of spelling between Peterman and Petermann. There are two questions on this census dealing with marital status. They read "Whether single, married, widowed or divorced." and "number of years married?". The original notation indicated that Bernard was married for 22 years. The "M" for married was crossed out and "W", for widowed was written in. A line was drawn through the 22. Since Sophie had just died in September of 1899, this could mean he and Sophie were married around 1878. Although, since his own birth date varies widely in the various records, he might not be the most reliable source of information for dates. I don't know why Christian is not listed in this census. He would have been only about 16. He is not listed as a separate member of another household in the 1900 census. It could be a clerical error. Holine Herrman was the "housekeeper". Her daughter, Clara Herrmann, married Armine (?) Eitner. They had a daughter, Helen, who is in several photos with Annie or Christian. John, born December 1843, age 61 "married", born in Germany, number of years in the US, 21, naturalized, occupation, dock foreman, renting house. John, born September 1878, age 26, single, born in New York, occupation, Mate S.S..
Christ, born April 1873, age 22, single, born in New York, occupation, laborer. Meta, born January 1886, age 19, born in New Jersey, no occupation listed. Anna, born October 1887, age 17, born in New Jersey, no occupation listed. It makes no sense to have immigrated 21 years before and have a 26 year old son born in the United States. Christian was born in 1883, not 1873. John senior was widowed, not married. On May 19, 1909, John B. Petermann, age 63, died of chronic myocarditis and nephritis, birthplace, Germany, in the USA for 25 years, address, 1101 Washington St., Hoboken, place of death, St. Mary's Hospital, Hoboken, in the hospital for 20 days, parents, John and Gesicca (sp?) Petermann. John Bernard Petermann was buried in Flower Hill Cemetery, Hudson County, New Jersey on May 22, 1909. Sophia Peterman was buried on October 1, 1899 in lot number 6, row 3. This plot is in a very nice section of the cemetery with some impressive markers. However, there is no marker on the Petermann plot. 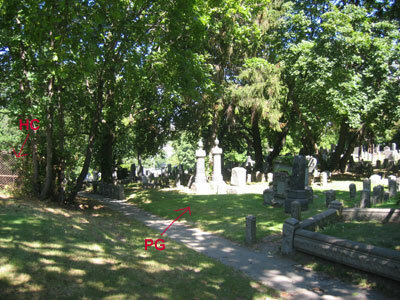 The location of the grave is near the northeast corner of the abutting Hoboken Cemetery (marked HC with red arrow). PC (with red arrow) indicates the approximate location of the Petermann Plot. Meta and Anna went to work in the garment district in New York City, because the housekeeper, Mrs Herrmann, insisted that they work. Note: How long did Mrs. Hermann stay with them? She was listed with the family in the 1900 census but was not listed with them in the 1905 state census. Meta and Annie are not listed with an occupation in the 1905 state census. Meta and Percy met at a dance in Jersey City. Percy worked at Hog Island during the WWI. Hog Island was a large ship yard outside of Philadelphia. "To me she was a pioneer in life in Hauppague when she married--- from a heated, gaslighted, indoor plumbing etc home to rural living--- kitchen range + pot-bellied parlor stove for heat, no bathroom, kerosene lamps. They had their first automobile in 1911--- the second family in Huappague to own one. Bud Land said that Meta and her sister, Annie, walked from Hoboken to New York in a tunnel. That tunnel would have to be the PATH tunnel between Hoboken and Manhattan. The first attempt to build a tunnel under the Hudson was started in 1874 and was abandoned in 1892 for financial reasons. In 1902 construction was restarted by the New York and New Jersey Railroads. Two tunnels were completed running side by side from Hoboken to Morton Street in Manhattan. These tunnels opened in 1908. They later became part of the PATH system. Meta and her sister, Annie, had a reunion in Smithtown with three childhood friends from Hoboken. The friends were Katherine (Tina) Bunger, Mildred (Millie) Rost and Ella Olsen. Unfortunately, the date of the reunion is not known, although it probably occurred in the late nineteen twenties or early nineteen thirties. There are photographs and a newspaper clipping recording this reunion. See Meta's Friends From Hoboken. Katharine Bunger made her Confirmation at St Matthew's Church in Hoboken, New Jersey on Palm Sunday 1901 along with Meta Petermann. Annie Petermann, Mildred Rost, and Ella Olsen were not listed on the confirmation program for Palm Sunday 1901 and must have been confirmed in a different class. To see a group of four photos of Meta, Annie and Tina circa 1905, go to A Summer Walk. Tina also visited with Meta and Annie at the beach and in Hauppague in the early 1900s. For pictures of these events See Relatives and Friends of Meta and Percy. During WWII Charles Alfred Benedix of 156 South St, Jersey City, born Jan 9, 1885, wife Mildred Benedix, worked for Mongomery Ward and company on Varick street in NYC. Relatively few people emigrated in isolation. People immigrated to a place where there were already other family members, friends or neighbors. In looking at the immigration of all the families I am researching, I am trying to find other family members who immigrated around the same time. It would seem likely that Johann and Sophie immigrated to Brooklyn because the knew people in Brooklyn. Since Hoboken is such a short move from Brooklyn, they might have moved to New Jersey independent of other family. I have not found any other Petermanns or Steuers who seem to be related to Johann Bernard and Sophie. Johann Petermann and his family were not listed in the 1880 census in either Brooklyn or Hoboken. There are no Petermanns in either Brooklyn or Hoboken who seem to be related to Johann Bernard Petermann. There are other Petermanns in the civil records in New Jersey, but none of them seem to be related to Bernhard. There are no other Petermanns in the 1900 census in Hoboken, New Jersey. There are a number of Petermanns in Brooklyn in the 1900 Census. I did a search of Brooklyn births from 1866 to 1887 (two years after the Petermann's were known to have moved to Hoboken). There were 17 Petermann births during that time span. However, none of these births occurred in the Ward in which the family of Bernard Petermann lived. It must be remembered that unrecorded births before 1900 were quite common. There are several Steuers in the censuses in Hoboken and in the civil records in New Jersey, but none of them seems to be related to Sophie. There are no Steuers in the 1880 census in Brooklyn who seem to be related. Benjamin Steuer, born January 1885, age 14, born in New Jersey, grocery clerk, boarder with (Can't read) Benken (?). Note: He is living next door to the family of Benjamin Steuer, listed below. Benjamin, head, born June 1860, age 39, married 15 years, born in Germany, immigrated, 1882, alien, laborer. John, son, born February 1888 in New Jersey, at school. There was only one listing in the 1910 federal census for Steuer (Stauer and Stuer). Herman and Charles who were listed in the 1909/10 Hoboken Directory were not listed. I checked for Steuer in the Brooklyn births between 1866 and 1887. There were 9 births recorded between 1878 and 1887, none in the Ward in which the family of Bernard Petermann lived. Carl August Steuer was listed twice in St. John's German Evangelical Church in Jersey City. Anna Marian Steuer of Charles August Steuer and Anna Lampe, born December 1899, baptized March 25, 1900, sponsors anne Gapp and Charles A Steuer, Jr., #973. Note: This is the same church where Anna Petermann married William Wulpern in 1909 and where their children Diana and Gerard were baptized in 1910 and 1912 respectively. Note: Sophie Steuer Petermann had two brothers, Christian Johann Gerhard Steuer and Hinrich Christian Albercht Steuer. Hinrich died in Bremen in 1922. She also had a sister, Margarethe Helene Steuer. There is a photo of Chris Kruger labled a "cousin of Meta and Annie Petermann". Kruger was a very common name in the records in Hoboken and I have not yet been able to find any records for Chris Kruger. Auffarth Beke Margarete Auffarth born Hohenboken, Ganderkesee, Germany married Otto Christian Steuer. They were the parents of Sophia Steuer who married Johann Berend Petermann in 1879. Did our ancestors know each other? Click on the photo of Tom and me for a discussion of this possibility.